As we head into 2016, many people are reflecting on the year that has passed. But I’ve had enough of looking back at 2015, so instead I’m looking ahead. And while I do this, I just wanted to check with you if you’re sure about what you said about it never being a more exciting time to be Australian? I’ll admit now, I don’t feel excited about our future. I feel a sense of trepidation and doubt. Just like your government told me to. To give you some context, I am a 34 year old with a husband and one child. My husband and I have careers that we enjoy, a comfortable home and a great lifestyle. We have all the ingredients for this exciting time you keep harping on about. But what is missing is optimism about the future. I don’t think I’m alone amongst my generation in my sense of doom and gloom about what the future holds for us. But can you really blame us after the last 7 years we’ve had? Let’s have a look at what might have dented the optimism of Australia’s young families over the last few years so you’ll understand why we’re struggling with understanding why on earth you think we should be excited. Just as our careers were being established, the Global Financial Crisis hit. We were lucky enough to live in a country with a government at the time who acted quickly to avert disaster, and a recession was avoided. The rest of the world weren’t so lucky. Of course world financial crises are bad for everyone in a globalised market; it’s hard to think of many industries in Australia who didn’t take a hit. Nevertheless, our economy chugged along and didn’t go backwards, and we avoided devastating unemployment and its associated social problems far better than most other developed economies. So why didn’t we feel excited? I’ll tell you why. It’s because your Liberal Party – while in opposition and in government – turned Australia’s death-defying-recession-avoiding stimulus package into a bad thing for the economy and told everyone that the Labor government were wrong for doing it. And guess what? When you tell everyone the economy is ruined and that debt and deficit monsters are hiding under the bed and that the country is going to-hell-in-a-handbasket because we spent money saving the economy from ruin, guess how everyone feels when they’ve seen this all on the news every day for 7 years? Everyone feels a bit nervous! And then what happens? The economy feels a bit nervous and there is no optimism. See how your party’s political games cost this country 7 years of hope and optimism? So now you’re here, telling us to be happy, to be excited, to get out there and invest in new businesses and to be entrepreneurs and to create the future jobs and to make a bright future for ourselves. But how are we meant to do this when you’ve spent all this time telling us the economy is a debt-ridden, risky, job-less mess? How are we meant to do this when you and your Liberal mates have turned this economy into a debt-ridden, risky, job-less mess? Hardly any of us have had a proper pay rise in 7 years and house prices are just getting more and more unobtainable on our stagnant wages. Jobs are disappearing too, even in new industries that were just getting started, like in the renewable energy sector. Do you see how your political games have hurt our country and how throwing around a few phrases about ‘exciting times’ is about as little too late as thinking you can eat a birthday cake after it’s already been flushed down a toilet? But it’s not only the economy we’ve all been told is a big, scary, mess, thereby having any optimism and confidence kicked out of us. It is climate change too. Sorry to have to remind you again, but you’re the Prime Minister so you can do something about climate change now. You’re not just a white-anting, back-stabbing, sniggering-behind-Abbott’s-back never-crossed-the-floor-and-therefore-just-as-responsible-for-this-mess-of-a-government-as-the-rest-of-the-bastards Minister in the Abbott government anymore. 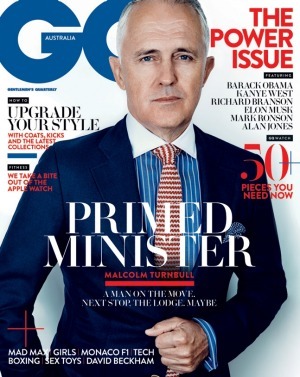 You’re the new Prime Minister in the Abbott-Turnbull government. Adelaide is having the earliest, hottest December heatwave we’ve ever had, and across the world there is evidence of climate change expressing itself in natural disasters everywhere. Our generation, who were told by your government that the Carbon Price was an unnecessary extravagance the economy couldn’t afford, is now really scared by the knowledge that even with agreement in Paris, it is likely too late to undo a lot of the damage inaction by governments like yours has caused. What’s exciting about that? And then of course we have the social policies your government is busily being very anti-social about. Eating away at universal healthcare. Taking family tax benefits from families, paid parental leave from new mothers, making it harder for the poorest in society to make ends meet. And we’re told we can never retire because the government piggy bank won’t have any money in it for us once the baby boomer generation has been cared for well into their 90s. And what about tax policies – when you could be going after the richest of the richest companies to pay only what they legally should be paying, but you refuse to do that and instead are driving up our cost of living by ‘talking about’ increasing the GST. We know you’re going to do it so just get it over and done with already. The impact of that decision on consumer confidence (and by consumer I mean everyone who lives here), will be another dagger in the heart of the economy. I have absolutely no doubt it’s always been a very exciting time to be Malcolm Turnbull with your little white fluffy dogs in your harbour side mansion. But ‘excited’ is not a word I would use to describe the overarching vibe of my generation who has been pummelled by your political party for political purposes for far too long. In fact, the only thing that excites me about the future in 2016 is the chance to vote you and your excitement-killing government out with you. That is something to be optimistic about. I literally am speechless … this is amazing! Well put, Victoria, agree with you completely. Words have great power …. both to uplift and to damage …. I am older than you, but equally concerned about what the future holds for us all. Hi Victoria! I hope you and your family had a good Christmas and that this coming year may hold some hope for the Australian poor. No! I am not going to hold my breath waiting for Mr Fluffy Duck Turnbull to parade his economic wisdom as he pumps his chest about the Free Trade with China, which will bring nothing to our neck of the woods, for our industry might has collapsed into a sea of mud delivered from hell and no technical smart phone will pull us together. I watched 60 Minutes on Sunday night about the Korean Ship Building and guess what those welders are payed more than our manufacturing vehicle welders. The other surprise was the amount of cash paid to the managers and directors within this massive ship building Korean Enterprise which is about four times that of a welder. Hell no, there is no mega millions paid out to the directors and CEO’s in Korea like here in Australia and elsewhere within this so called industrial nations of this world while they look at Asia and say third world countries. Oh yes Mr fluffy duck Turnbull, it is about time you followed the Korean business plain as it is working full stop and no one is on the doll. Excellent analysis, Victoria. I thought, at the time, the opposition should have been charged with sedition. I would love some economist to forensically study the costs of the constant opposition (for opposition’s sake) during the Rudd/Gillard years. What a brilliant open letter to Malcolm Turnbull Victoria! This needs a much wider audience in the hope it will wake up Australians who still think Turnbull is great. I just found this blog today and will search out your first book on Amazon. Australia needs more voices like yours!